Chief correspondent Jason Jiang writes that despite the ongoing China-US trade spat, 2019 looks set to be an improving one for the grain trades. John Wobensmith, CEO of US-listed bulker giant Genco Shipping & Trading, anticipates a recovery in the global grain trade in 2019 following a year in which trade flows were affected primarily towards year end due to the US-China trade dispute. “In the short-term, we are currently entering peak South American grain season in which it is forecast that Brazil will produce another strong crop. Furthermore, with recently reported purchases by China of 10m tonnes of US soybeans, the trade dispute between the world’s two largest economies appears to be easing. As such, we expect a more traditional peak North American grain season during the fourth quarter of this year,” says Wobensmith. According to a recent BIMCO report, 2019 has seen the highest ever export of soybean during the month of February. Exports totalled 6.1m tonnes, a 112.6% increase from the 2.9m tonnes exported in February 2018. China, the world’s largest soybean importer, is showing strong demand. Of the 8.2m tonnes exported by Brazil in the first two months of this year, 7m tonnes have been sent to China, twice as much as was sent in the first two months of 2018. The proportion of Brazilian soybean exports going to China has been increasing in recent years, from 32% in 2005 to 82.3% in 2018. Peter Sand, BIMCO’s chief shipping analyst, believes increased exports bring some relief to the dry bulk market. “The recent upturn in panamax and supramax earnings is likely to be linked to the start of the Brazilian soybean exporting season. The large volumes being exported, in particular to China have driven up the demand for the mid-sized dry bulk vessels,” says Sand. Compared to the first two months of 2018, Brazilian soyabean exports have employed an extra 51 panamax loads (75,000 tonnes) or 3.8m tonnes. Of these, 47 loads (3.5m tonnes) are sailing to China, further increasing the tonne mile demand generated by Brazilian soybean exports. Rahul Sharan, dry bulk specialist at shipping consultancy Drewry, also expects 2019 to be a good year for grain shipping out of South America, but not Australia. “We hold a gloomy outlook for Australian grain exports as the country is expected to have reaped the lowest harvest in a decade. Drought conditions in the country have severely impacted wheat harvest, especially in the eastern region. On the other hand, Argentina is expected to reap a record harvest this season because of favourable weather conditions and an increase in sowing area,” Sharan says, adding that now Asian countries are replacing Australian wheat with Argentinian wheat which will increase tonne miles by 2.5 times for the same quantity of grain trade as most of Australian wheat goes into Asian markets. “Additionally, Brazil had a low domestic production this grain season and we expect its grain imports would increase. 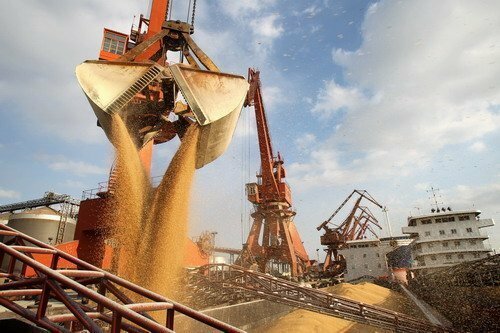 At the same time, a truce between the US and China will also pave way for long distance grain trade. Overall, 2019 should be a good year for grain shipping,” Sharan maintains. Darin Friedrichs, risk management consultant at INTL FCStone (Shanghai) Trading, has mixed opinions on grain prospects. “Beyond soybeans the US is probably pushing for purchases of other products like corn, sorghum, and DDGS (distiller’s dried grains with solubles) which would generate demand for bulk vessels. Additionally demand continues to grow as the world develops and producers harvest large crops. The Middle East, North Africa, and Southeast Asia are regions that are seeing great import growth especially in corn,” Friedrichs explains. However, Friedrichs reckons one challenge the market has to face this year is African Swine Fever which has been impacting China and recently spread to Vietnam. The deadly pig disease currently has no vaccine or treatment and it’s already had a big impact on demand for imported soybeans in China and now there is the fear it will spread throughout Southeast Asia. “This would directly reduce demand for imports like corn, soybean meal, and feed wheat and be negative for shipping demand,” Friedrichs says and he is also certain that this year should see Argentina return as a major grain exporter. “Last year its exports were limited due to drought and we see saw a situation where ships were actually delivering soybeans to Argentina to cover shortfalls,” Friedrichs adds. Friedrichs observes that the US and China are both reorganising to be less dependent on each other. “China has been trying to increase imports from new sources in Africa and Asia as well as continuing stronger imports from South America. Similarly the US has been trying to increase demand in markets like Southeast Asia to help offset the loss of the business to China,” says Friedrichs. China and the US are reportedly in the final stages of completing a trade pact after a series of negotiations, with Beijing offering to lower tariffs and lift restrictions on US products in several sectors including agriculture, and the US is also considering removing most sanctions levied against Chinese products.